Recent Lily breeding has created some huge and beautifully fragrant Oriental type Lilies, in their pinks and whites, their brighter, bolder and brighter Asiatic cousins seem to have been left out. Not any more following their breeding with the ever-popualr Longilforum scented lilies, to create Longiflorum Asiatic (LA) hybrids. With their beautiful sunshine rays of colours in a range of bold 'fruit-salad shades' in yellow, berry pink, orange and red, these vibrant and hot tropical colours really light up your hot summer garden, and they even inherit some of the fragrance of their parents too. Short and strong enough to grow in pots, yet tall enough to cut armfuls of flowers each summer, they are versatile, and very hardy and easy. Plant en masse in large pots or in groups for maximum impact, or maybe just dot them round your garden to brighten up odd spots. Plant in spring, and pick in summer - and again year after year. 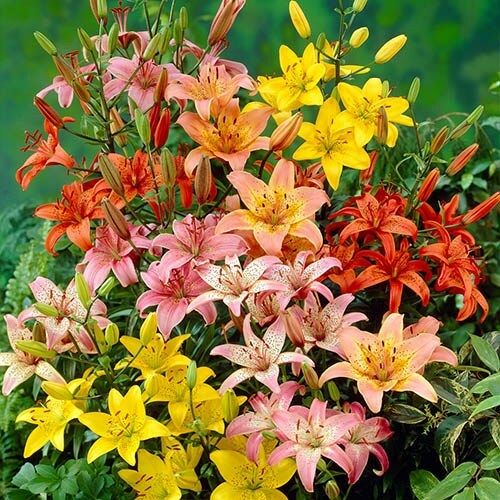 Great value and easy to do Lilies. Supplied as 1 bag of 25 mixed colour bulbs in a mix of 4 bold & bright colours. Bulbs size 10/12.